Eddie Howe has only been a manager for six years but has already achieved enough to be named as the first Football League manager of the decade. 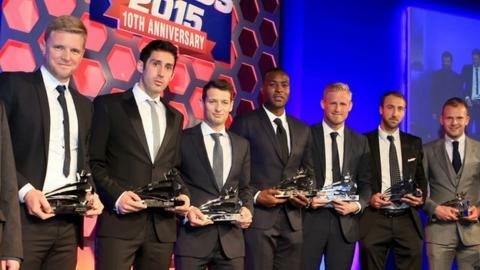 Howe received the accolade at the 10th annual Football League awards ceremony as recognition for his achievements with Bournemouth. In two spells, the former Cherries player has guided the club from Football League survival after a 17-point deduction in 2008-09 to within two games of reaching the top flight for the first time. The 37-year-old is on course to become one of only a small selection of managers to have guided a team through three divisions into English football's top flight, but how has he done it? Here BBC Sport speaks to three men who know Howe better than most. John Williams was in charge of Bournemouth's centre of excellence, first meeting Howe as a shy 13-year-old. The former Cherries defender has been a summariser for BBC Radio Solent for over 10 years, watching Howe learn his craft as a manager. "He was quiet as a mouse. If you can imagine your first day at school, Eddie was like that for quite a while," Williams told BBC Sport. "In fact it nearly hindered him. There was an awful lot to come out in terms of personality and character. Tony Pulis [Bournemouth manager at the time] wasn't that sure whether he could come through. We had to get Tony to come down and watch him on a number of occasions before he took him on. "Once he got in the changing room, he found his feet. He was one of the boys. When you get in the first team, it's another cup of tea. I remember him being man of the match in his first game. "He is a fantastic, polite lad, who has become determined, super hard and that's the reason why he is hopefully going to be picking up the Championship in two weeks' time. "He's learned things from managers he's played under. He's had some crackers like Harry Redknapp at Portsmouth. "This is the best Bournemouth side I have seen going back to 1986. I speak to fans of 50 and 60 years and they say they have never seen such dynamic football. "The attention to detail is the one. He is always looking for that different edge, that little angle. How your team, plays, defends - he is always trying to pick up on something that is going to make a difference." How does he compare with other Football League managerial records? Steve Fletcher was Howe's team-mate at Bournemouth and played under him in the final years of his career. Fletcher is Bournemouth's record league appearance holder and now works in their player recruitment and scouting department. "He's so dedicated, he is meticulous," Fletcher told BBC Sport. "He works so hard and has a passion for this football club. "I keep a diary because I like to look back and reflect and put a new slant on things," Howe told BBC Radio Solent. "One of the most difficult aspects of the job is to keep things fresh, we hate to repeat things. "The big challenge is to come up with new drills that are actually going to work and there is no better feeling when you come up with an idea you like. A lot of our best stuff comes from us, the homemade drills. When you see a problem and identify a drill to solve it that is very satisfying." "He eats, breathes and sleeps football. It is his club. He watched as a boy from the terraces and he'd do anything to see Bournemouth get to where he wants them to be. He'll stop at nothing. "I played for 24 years under some fantastic managers and he stands out. He is a million miles ahead of everybody else. He is just different. Every little thing you wouldn't think matters, matters to Eddie. I believe he will go on to do bigger and better things - hopefully with Bournemouth but he's definitely a unbelievable manager in the making. "He is so meticulous on the training ground, his attention to detail is phenomenal and his man management skills are brilliant. "He was my room-mate for a while - looking back I always realised he had an old head on young shoulders and he thought about things in more detail. He was a very deep and private man. 2014-15 Bournemouth are second in the Championship and two wins from sealing promotion to the Premier League. 2012-13 Howe returns to the Cherries and guides them to promotion to the Championship. 2010-11 Eddie Howe leaves Bournemouth to join Burnley as the club finish eighth. 2009-10 The Cherries finish second in League Two and earn promotion. 2008-09 Bournemouth survive relegation and finish 21st in League Two, despite a 17-point deduction. "Nobody could foresee the success he's had in such a short space of time. It's phenomenal what he's achieved. The award just proves how highly thought of he is. To have played with him for 11 years and then under him for five years and to have been his friend for 22 years, I'm so proud." Harry Redknapp has always been considered Bournemouth's greatest ever manager - until this season. Redknapp signed Howe as a player at Portsmouth. "I produced teams that play good football," Redknapp told BBC Sport. "I had 10 years at Bournemouth, I was the most successful manager in their 100-year history. Eddie Howe has come along and blown me out the water. He is fantastic - I love watching them play.